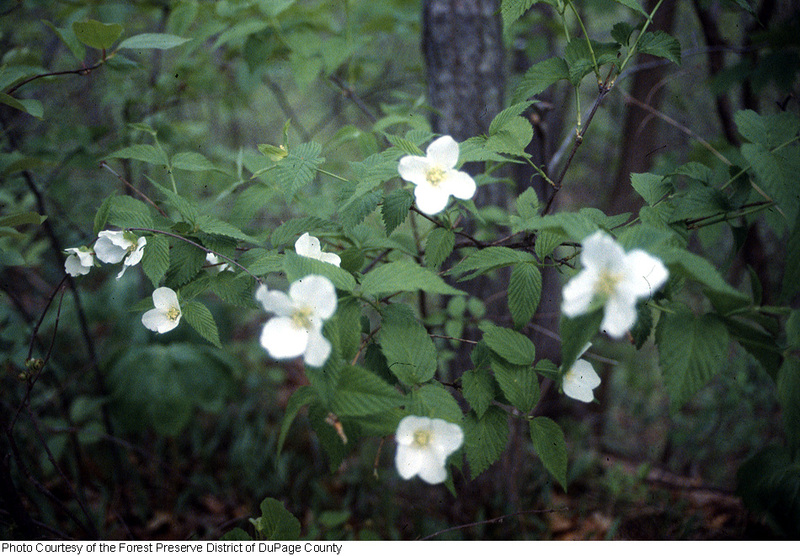 Philadelphus floridus.The Morton Arboretum.Photo Courtesy of the Forest Preserve District of DuPage County.SEINet.org.swbiodiversity.org (Accessed 7/2014). Philadelphus floridus is a shrub to 3 m tall, twigs dark brown, pith white, solid older bark grooved, shreddy, pale, brown, branching opposite, stems arching, rather weak, brittle, young twigs brown, leaf scars horse-shoe shaped, with winter bud in center, under base of petiole; vein scars three. Leaves opposite, egg-shaped, 4-7 cm long, tip long-pointed, base pointed, densely hairy below, margin remotely small-toothed, 3-veined at base, dull dark green above, pale below. Flowers white, 5 cm wide, radially symmetrical, petals 4, calyx lobes 4, hairy, attached to expanded floral base (Rehder 1990). Origin: Southern US, NC, GA.
Habitat: Probably an overgrown horticultural specimen.